Police in Kenya are hunting a gang who killed a British man and kidnapped his wife at a resort in the country. The couple, believed to be David and Judith Tebbutt, aged 58 and 56, from Bishop's Stortford, Hertfordshire, were staying at Kiwayu Safari Village. Kenyan police said the motive was unknown but it was being treated as a "bandit attack". The Foreign Office called for the release of the woman, who is said to have been taken away by speedboat. A spokesman said: "We have deployed a consular team from our High Commission in Nairobi and are offering all possible support to the family of those involved. "Our thoughts are with them at this difficult time. We are working to secure the safe and swift release of the British national who has been kidnapped and ask those involved to show compassion and release the individual immediately." The Foreign Office has not confirmed the names of the couple, but it is understood Mr Tebbutt worked in publishing. Literary agent Carol Blake, who sat on a book charity board alongside Mr Tebbutt, described him as "calm, dependable and wise", and a seasoned traveller. "I'm not at all surprised to hear that he may have been defending his wife. I can't imagine what their son is going through," she said. Local police said the couple had checked into a cottage at the resort on Saturday - the only guests, following a trip to Kenya's Masai Mara reserve. Shortly after midnight, the gunmen entered the couple's room and fired a single shot, they said. Speaking at a news conference, police commissioner Mathew Iteere said: "They do not have doors, those cottages. They are using the cloth as the doors. So I think they gained entry so easily and it was only one shot. Right on the Indian Ocean, Kiwayu Safari Lodge is an isolated resort with simple thatched cottages dotted along the beach. It has lost some of its attraction now though and many Kenyans worry the attack may keep tourists away. They depend on the industry to survive. This country has had its fair share of incidents that have prompted travel advisories to be made. Some have been seen as unfair blanket travel warnings which lead to job losses. Here, soldiers are patrolling the resort and the regional police chief has flown in by helicopter. It is difficult to imagine the horror that the British couple would have faced when gunmen burst into their room in the middle of the night. After David Tebbutt was shot in the back, the gang forced his wife, Judith, onto a speedboat headed north. Worryingly, Somalia is just 90 minutes away. Most people here are convinced the group came from Somalia, either pirates or men with links to Islamist insurgents, al-Shabab. One resident told me the gunmen even forced a Kenyan to guide them to the resort. "Maybe they wanted to take the two and he [the husband] resisted and that's why he was shot." There was no evidence to suggest the attackers were from Somalia nor that Islamist group al-Shabab, which has links to al-Qaeda, was involved, he said. "So far we do not really know the motive. We are treating it as just a bandit attack," he said. "But since we are reliably informed that they abducted that lady, maybe sooner or later they may contact us, maybe seeking ransom." 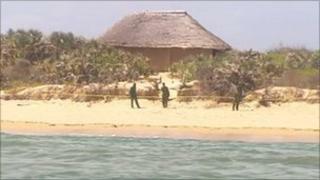 Kenyan officials said a police officer had seen six men taking away a woman in a speed boat. The BBC's Will Ross said parts of the resort have been cordoned off and soldiers deployed to the area were stopping the media from accessing the coastline. The website for Kiwayu Safari Village, which was shut down following the attack, said the resort had round-the-clock security which was reviewed regularly. The village is about 45km (28 miles) from the Somali border. The Foreign Office continues to advise against all but essential travel to within 30km (18 miles) of Kenya's border with Somalia. There have been previous attacks by Somali militia into Kenya, it says. Kenyan police said they had been on high alert in many areas of the country on the anniversary of the 9/11 attacks in the US. Mr Iteere said reinforcements had been sent to the north-east and coastal provinces, including to provide more roadblocks. "We are going to continue [these measures], not just because of this incident, we had done it because of that anniversary of September 11," he said. The BBC's security correspondent Frank Gardner said the attack - which appeared to be well-planned - was unusual for such a remote and exclusive tourist resort, despite being near the Somali border. He said it remained unclear who was behind the attack and their reasons for it, but three possibilities were insurgents from southern Somalia, pirates or land-based bandits. A crisis meeting involving regional experts was being led by the Foreign Office in Whitehall, he added.